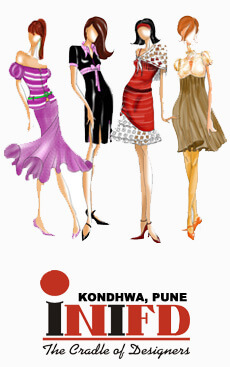 INIFD Fashion Designing Course is one of the most thrilling career options in today's world. It is needless to say that in a country like India, where textile and garment industries have been flourishing for ages, the recent boom in fashion designing has led to innovation and new prospects in the existing domain of garment and fashion accessory design. INIFD in Technical Collaboration with Istituto London school of trends, the most reputed international giant established in Milan- Italy in 1961, has an international certificate course in fashion designing its curriculum. LST offers advance system of research and every year introduces the gifted graduate students in the fashion industry. Over 10,000 people in the world use Istituto London school of trends system. LST with its tie-up with INIFD is all set to provide international fashion trends to the design students of NIFD which will give INIFD an exulted status among all other INIFD Fashion Designing institute in Pune. Revolutionizing fashion and setting trends INIFD is now equipped to furnish global exposure of latest trends by such international certificate course. Visiting lecturers of repute and even international assignments to its students are part of their curricula.